Glass is rocket science for high performance buildings | Sustainable Engineering Ltd.
During a presentation at the South Pacific Passive House Conference in Christchurch (March 2017). I spoke on lessons learned from New Zealand projects. One of the biggest lessons we’ve learned is that windows are the rocket science in high performance buildings. They are very advanced technology originally from the space industry and they can make your building high (sky high) performance or not. When you are looking to understand how a project is going to be impacted, in terms of energy, the two most important numbers to focus on are the g-value and the Ug value. The g-value of the glazing is a simple ratio of how much energy enters the building through the glass assembly compared to the energy that hits the glass. For example, clear double glazing has a g-value of 0.77 so 77% of the energy that hits the window makes it inside. A special spectrally selective double glazed window can reach a g-value of 0.45 or so while still allowing most of the visible light through. Tinted glass can then reach down to obtain any g-value down to ZERO which means it is completely opaque and no energy makes it through the glass – buit also no daylight. The g-value is approximately the same as the SHGC (Solar Heat Gain Coefficient) used in the USA or 0.87*SC where SC is Shading Coefficient. The Ug value is the thermal conductivity of the glass assembly (W/m2K), including the surface films, and is the inverse of the assembly R-value. The calculation of the g-value and Ug, for Passive House must be done per EN673 and EN410. As these calculations are not commonly available in New Zealand or Australia we’ve assembled the table below and an Excel file which allows these values to be pasted into your PHPP file. Please do not distribute these files and link to them instead. That way if I find any errors they can be updated. 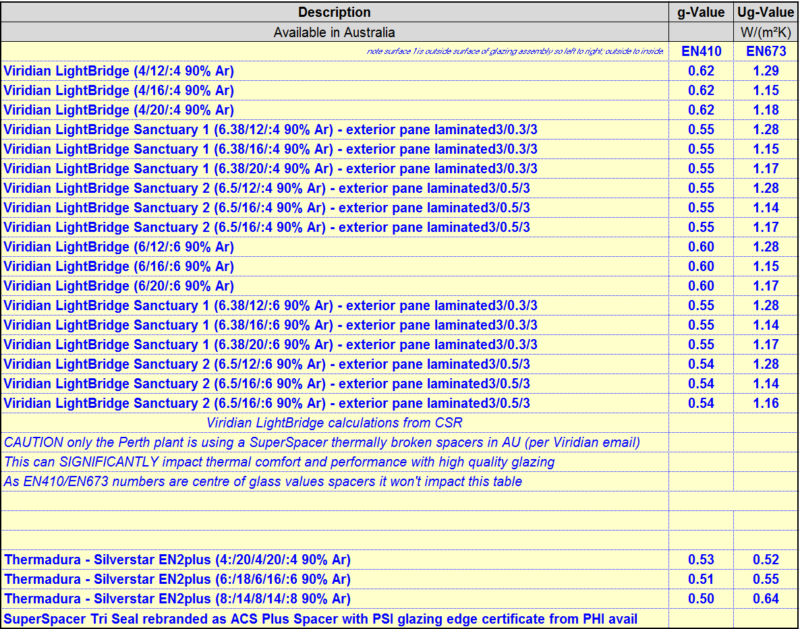 If you know of more manufactures with glazing and calculated values (per EN410/673) please provide it to me and I’ll update the table. Note that the use of high performance glazing results in very low heat losses out the glass. Potentially, the exterior surface of the exterior pane of glass will cool to below the dew point resulting in temporary exterior condensation or deposition (frost) on the surface. Experience in NZ has been that occurrence of external condensation is associated with a clear night sky and high view factor for the glazing. 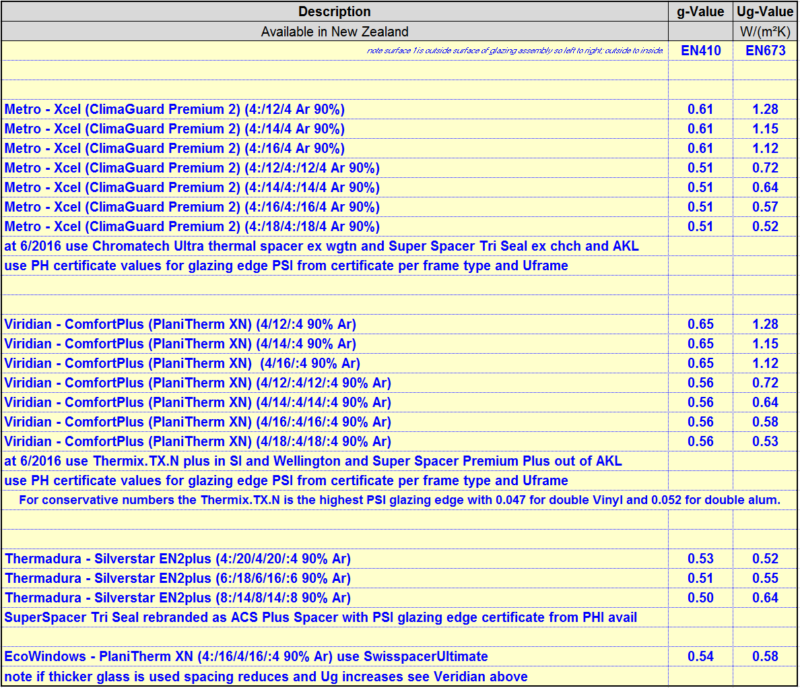 External condensation has been reported for high performance double and triple glazing installed in NZ.